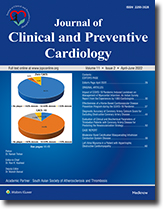 An affiliate of the South Asian Society of Atherosclerosis and Thrombosis, the Journal of Clinical and Preventive Cardiology is a peer-reviewed Print+Online Quarterly	journal. The journal’s full text is available online at http://www.jcpconline.org. The journal allows free access (Open Access) to its contents and permits authors to self-archive final accepted version of the articles on any OAI-compliant institutional / subject-based repository.